I have a confession to make. I have not been entirely truthful with all of you. I have been cooking this summer, but not dinner, and not dessert. I have been making jam. I understand jam making to be the latest trend among “hipsters” (google “hipster” and “canning” and you’ll see what I mean.) I never really thought of myself as a hipster, I mean, I’m certainly not a hippie because I don’t like hiking or Phish, and I can’t be a yuppie because it’s not 1987, so I turned to Urbandictionary.com to determine if I am, in fact, a hipster. A quick skim of the 138 definitions of hipster yields a person in their 20’s or 30’s (yes) who lives in Brooklyn (no), values “creativity, intelligence and witty banter” (yes), drinks a lot of Pabst Blue Ribbon (no), sports “high cultural tolerance and a slight tendency towards intellectual arrogance” (yes), is too ironic for their own good (maybe), and is cooler than cool (heck no). What I am not confused about is this: making jam is a) fun b) easy and c) cool (which may be the hipster connection. I’m certainly not putting PBR into my jam). There’s something special about those little jars of homemade preserves, all lined up, ready to be eaten, or given away as gifts, or, if you have a packrat nature (like nobody I know, nosirree) to be stored in the pantry and gazed at lovingly. My husband makes fun of me, pointing out that I have an Ivy League education, am admitted to the Bar in two states, have a successful career and yet I am proud of making jam, something his great-grandmother did on a regular basis without much fuss. So sue me. I’m proud of my jam. I love my jam. I bid thee to go forth and make your own jam. You won’t be sorry. There are two parts to canning jam, both of which can be intimidating — the cooking of the jam and the canning for preservation. On the first point, here are a few tips: use the peels of the fruit — they tend to have higher pectin (the stuff that makes the jam jammy, rather than syrupy), cook it longer than you might think (it’s really just candy – use a candy thermometer to 220 degrees, or cook until it starts to firm up on a cool dish), and use commercial pectin if you’re either using a low pectin fruit (like rhubarb) or are worried about the jam factor (I don’t mind if my jam is a little runny, myself). On the canning part, calm down! I know there are a million botulism horror stories out there, but jam has a slightly higher margin of error, since it is so acidic and so sugary, both of which help preserve the jam and make it less susceptible to bacteria. Also, the process really isn’t difficult, though it helps to have a few good tools, like good tongs, and a rack that fits inside your biggest pot. I found this canning kit at Amazon to be reasonably priced and very useful, and the rack fits perfectly into my 8 qt. stockpot. Take those little half pint jars with the lids and the separate rings and pop them in boiling water for at least 10 minutes, but you can just leave them in there while you’re cooking the jam. Fill the hot jars with hot jam, leaving 1/4 inch of space, wipe the rims with a clean damp towel, then put on the lids and the rings and boil the jar in the boiling water for another 10 minutes. (The jars shouldn’t touch the bottom of your pan, which is why a canning rack comes in useful, and the water should cover the jars). Let the jars cool overnight (you might hear a “pop” as they seal) and then store them without the rings (so you know if you have a bad seal). I’ve found a good rule of thumb is that a pound of fruit makes about 1 jar of jam, and I tend to make no more than 4 at a time. I also like to make jam that’s harder to buy in the stores — the recipe below is for plum jam, which is unutterably delicious but nearly impossible to find at the A&P. If this is too much for you, you can just make the jam and keep it in your refrigerator. If you can it, you can save it forever and ever and pull it out of the pantry periodically to gloat over. What? Doesn’t everyone do that with jam? It’s also excellent on toast, over some Greek yogurt, stirred into oatmeal or filling a crepe. 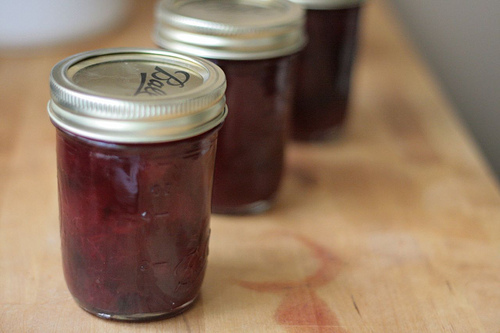 The only problem is that once you start making jam, you’ll probably be hard pressed to stop. My pantry is getting full. But at least I can make it through the winter. Combine ingredients in a large pot and cook over medium heat, stirring frequently, until the mixture starts to resemble jam -- i.e., when you drag a spoon or a spatula along the bottom of the pot, the separation remains for a bit before the syrup fills it in (this should be about 220 degrees on a candy thermometer, but it's OK if you're a little on the low side). Meanwhile, sterilize 4½ pint canning jars. Fill the hot jars with hot jam, leaving ¼ inch at the top, wipe the rims clear of any jam to get a good seal, and put on the caps and rings. Boil in rapidly boiling water for 10 minutes with the jars entirely covered with water but ideally not touching the bottom of the pan and with the caps and rings tightly on. Let cool. Once the jars are cool, remove the rings for storage. That hipster definition is funny. Its true we have more than our fair share of hipsters in Brooklyn but I don’t think we have a monopoly on them. I know I’ve seen some hipsters in Philly at the very least! I agree, you are not a hipster at all so you keep making your jam without apology. But what a weird trend for hipsters to pick up. All of them are so skinny (better to fit into their crazy skinny jeans) they can’t be eating much of that jam, can they? This is too funny, I was canning with my Dad when I was 8 years old. We make jam all the time. Does the mean I was the original hipster? Doubtful. Hilarious. I love that you suggest swirling jam into your oatmeal. I always get strange looks when I do that. Nice to know I’m not alone. 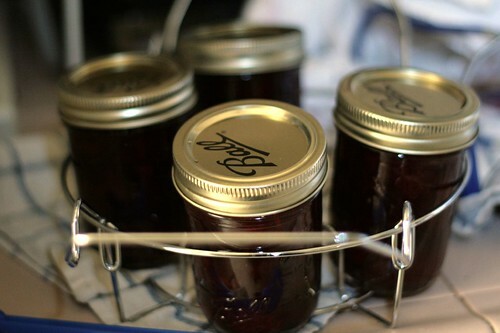 Until we lost our plum tree to termites a few years back, I must have made 12 cases of Plum Jam every summer. Now we have olallieberries so I work with them. My most requested version was Cardamom-Plum. 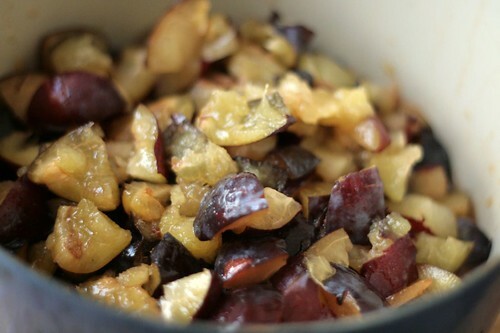 Just put a tablespoon or two in the plums when you add the sugar. Really a terrific flavor combo. When I was a kid, we had a batch of apricot jam that didn’t seal properly so we dumped it into a homemade vanilla ice cream recipe. To this day, I recall the taste perfectly, but the fact that I had to take several turns on an old fashioned hand-crank ice cream maker may have had something to do with making an impression on me! In any case, I’ve never been sorry if a canning experiment goes awry; there’s ALWAYS a solution! My mom canned green beans when we were growing up and the process never appealed to me. I love that all the environmentalists and “go green” trendsters are all hot to trot on canning now. There is something about those little glass Ball jars that I find so appealing though. I remember eating my Great Aunt’s homemade strawberry jam in Florida one summer. I nearly made myself sick on biscuits and jam b/c I couldn’t get enough. We grew up eating homemade jams & jellies. And mom always canned tomatoes and peaches. LOVED it. I haven’t kept up with the tradition, but I really need to get my feet wet. Maybe this year. 1. Do you wear tight jeans? 2. Do you have choppy hair that you constantly flick out of your eyes? 3. Do you mourn the loss of the Misshapes? 4. Do you know who the Misshapes are? 5. Do you read Nylon magazine? Oh, I love this post! My mom always used to make plum jam during the season. I am craving it right now. You’re so funny! We stay out of the hipster crowd and make jam anyways! Your jam looks just amazing, just amazing!!! 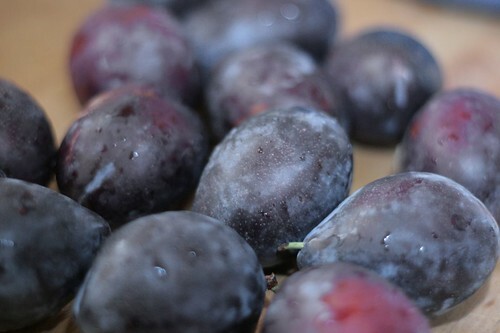 Those plump plums wouldn’t last too long in our kitchen. And your gorgeous jam wouldn’t last ONE hour with us! my ever patient husband Chris has taken over canning since my arthritis has become so unmanageable. He’s been using all sorts of fruit and veges available from the garden and retail locally (Vancouver Island, British Columbia, Canada). I’m afraid he’s becoming so disheartened the plum jan he’s been battling with all day just won’t co-operate just as 3 fruit marmalade. Does anyone in the know have any tips for fool-proof jams? Hmm, ronnie. Will it just not gel? Is he using enough sugar? My philosophy on jam is 1) always use the peels 2) cook for longer than you think you should and 3) If it’s runny, c’est la vie. It still TASTES good. Serve it stirred into yogurt or oatmeal instead of on toast. Or on toast on a plate. Sorry I’m not more helpful. Why shouldn’t the jam jars touch the bottom of the pan during the processing? Does anyone know? I’d assumed the racks were to prevent the jars from rattling around too much. But I suppose it could be that the jar bottoms won’t get hot enough if water isn’t circulating on all sides. In any case, what I do is line the bottom of my boiling pot with the jar rings to provide a little ad-hoc rack shelf on which to set the jars. Works fine. I’m making this jam right now. Can’t wait until it’s done. Last week was blackberry jam, and the week before was strawberries. I think I’m going to be baking a lot of biscuits and pound cake this winter! Love it! I think I became a hipster when I turned 30 a few years ago because that’s when I started taking my daughter berry picking to make jam just like my mom did when I was a little girl and now we’ve graduated to bigger fruit that is easier to pick in bulk. We did apple butter this summer and now we’re gonna try plum jam! I totally agree about the sight of the jars lined up being so satisfying, not to mention the memories I’m creating with my daughter and the skills that I’m passing on to her that were passed on to my mom from her mom and hopefully she’ll pass on to her daughters some day. 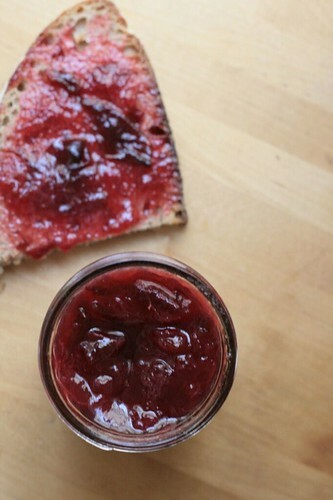 I am so excited to find a recipe for plum jam that doesn’t require red plums! The vacant house next door to me has a beautiful plum tree in the backyard that no one seems to know or care about. So, plum jam, here I come! I also proudly show off my canning achievements – and sometimes just stare lovingly at them when no one is around. When people come over for the first time, I give them the tour of the house, which goes something like this: This is the living room….here’s the kitchen, of course….and here’s my favorite part of the house – the pantry of canned goods! I so enjoy the comments with stories about how people came to love canning. I grew up in a decidedly un-domestic household in the 80’s, with a mother working long hours at a corporate job and lots of TV dinners and Steak-Ums (remember those)? In raising my own daughter, I realized that I had no idea how to cook anything that I actually wanted to eat. So I started reading everything I could, collecting cookbooks, and experimenting. Fifteen years later, food has become an obsession and a hobby in my adult life, from growing it to cooking it, and most recently, preserving it. I am so grateful for the internet and fabulous sites like this with recipes and stories and inspiration – Thank you!